Walking down Tacoma’s busy 6th Avenue there are lots of places to stop and grab a bite to eat. 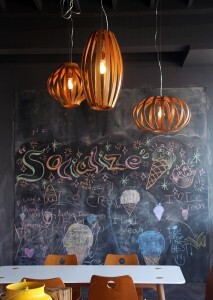 However, none are quite as sweet as Tacoma’s newest scoop shop, Ice Cream Social. up north and also to downtown Tacoma’s Hello Cupcake where she worked as a baker and decorator for several years, Isaac decided it was time to take the reins and start her own business. “I do enjoy eating ice cream, so it started there. It’s classic and timeless. I decided to give it a try,” says Isaac. In 2012 Isaac began perfecting her recipe, and by the time summer came around, her ice cream was already a favorite attraction at the 6th Avenue Farmers Market. As the year progressed, so did Ice Cream Social’s success. “People were interested in the product I was making, and I was making people happy, so the following year I decided to do more markets and events,” explains Isaac. 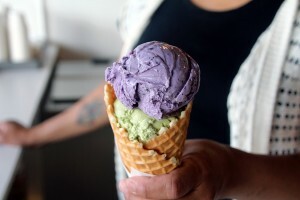 Local restaurants like Half Pint Pizza Pub (formerly Medi’s) featured Ice Cream Social’s handcrafted ice cream on their menus, and Isaac busily continued to push her ice cream cart from event-to-event across Tacoma. 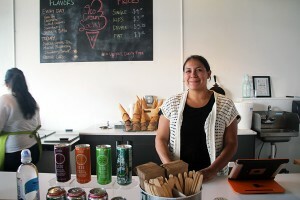 Business continued to ramp up, and it was time for Ice Cream Social to expand. excited. But, then again, what’s not to be excited about? Just take a stroll down 6th Avenue and you’ll find it hard to resist the tempting allure of fresh baked waffle cones piled high with scoops of handcrafted ice cream made with natural, locally sourced ingredients. peach, fresh fig, and many more. Isaac says she tries to source ingredients as locally as she can. “We get our blueberries from Terry’s Berries. The green tea is from Mad Hat Tea Company. We get our vanilla from Bedda Bella, and all of the milk and cream we use is fresh, local, and hormone-free from Washington,” she explains. newest scoop shop. And, if you just can’t get enough of Ice Cream Social, Isaac says they offer catering services for parties as large as (and sometimes exceeding) 1,500 people. “We offer our ice cream cart for catering service for private parties, weddings, employee appreciation days, and pretty much any occasion,” says Isaac. Isaac says she also plans to continue attending as many local events as she has time for, including the Broadway Tacoma Farmers Market, Proctor Arts Fest, and the fast approaching Brew-Five-Three: Tacoma’s Beer and Blues Festival. Isaac says Ice Cream Social will be making specialty root beer floats made with root beer donated from Silver City Brewery and loaded to the brim with Isaac’s handcrafted ice cream during Brew-Five-Three. attendance during this downtown Tacoma “block party” event. Tickets for the festival are $30 and include 10 tasting tokens and a collectible tasting glass. Isaac is excited to provide her community with a product that makes people so happy, because that’s what makes her happy. You can grab a cone or cup of Ice Cream Social ice cream Sunday-Thursday from 11:00 a.m. – 10:00 p.m., and Friday-Saturday from 11:00 a.m. – 11:00 p.m. Ice Cream Social ice cream is also available at local restaurants and bars including Maxwell’s, Gateway to India, and Hilltop Kitchen in Tacoma, and Taste of Peru and Morso Wine Bar in Gig Harbor. For more information, visit Ice Cream Social’s website here, or check out their Facebook page to see what event they’ll be scooping at next.